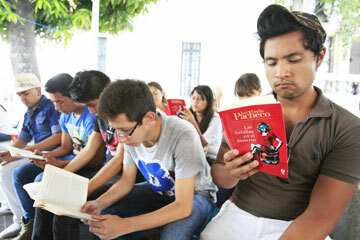 As part of celebrations for World Book Day on Tuesday, nearly 450 people read aloud a classic Mexican novel in an annual event organized by the University of Guadalajara (UdG). It took over nine hours for the book, “Las batallas en el desierto” by the late Jose Emilio Pacheco, to be read out in its entirety. Present at the event, held in the pedestrian precinct next to the UdG Museo de las Artes, was the author’s daughter Laura Emilia Pacheco. Starting the marathon reading were Marisol Schulz and Raul Padilla Lopez, director and president of the Guadalajara International Book Fair (FIL), the biggest literary event on the content held each year at the beginning of December.